This article focus to discuss on Sea Floor Evidence. The technologies developed inside the 1940s and 1950s also permitted more detailed mapping of the ocean floor and continental margins. An obviously better fit between the rifted continents is apparent once the shape of the ls slope is used instead of the continent’s shoreline. 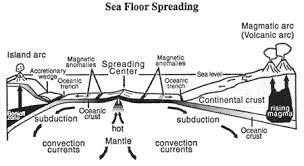 Here also discuss on Sea floor spreading, Magnetic anomalies and Modern plate tectonic theory.